Amagosa, a company specialized in food and beverage distribution, and catering related products, has upgraded their installations in the city of Merida (Badajoz). 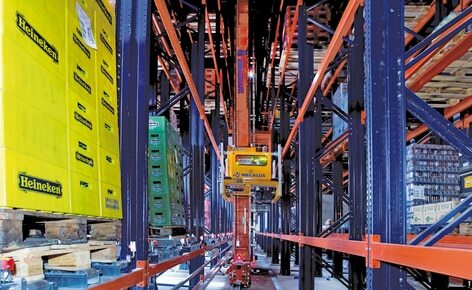 An automated clad-rack warehouse with conventional pallet racking, pallet flow channels and an annex building which coincides with input and output areas was built for them. They had two Clasimats, pallet racks and a picking station arranged inside the new facility. The Mecalux Easy WMS (warehouse management software), responsible for managing all activities of the center, was also installed. This clad-rack warehouse, measuring 85’ in length and 73’ in height, has two single and double depth aisles that allow for a storage capacity of more than 2,300 pallets. Being ‘clad-rack’ means that the racking forms the building’s structure and that the exterior covering is attached to them. In each aisle, a stacker crane carries out the movement of the pallets from the conveyor to the location designated by Mecalux Easy WMS. The stacker cranes´ implementation allows for an increase in productivity and at the same time decreases the resources needed for each operation. They installed twenty-four pallet flow channels with rollers on the first level of racks where picking of higher consumption ‘A’ type products is done. Each channel, that coincides with the ground floor, can house up to three reserve pallets. Next to that, a picking station has been set up in the shape of a ‘U’ for products with medium and low turnover (B and C). On both sides of the picking station they have placed two vertical Clasimat warehouses intended to store high value C type products (liquors, high-end wines, cognacs, etc.). Plus, they have raised conventional pallet racks where the most consumed products (B type) are placed. The operator who mans this station prepares waves of five orders at the same time. They are responsible for put­ting together and finishing the orders by filling the pallet with the picking of all the B and C type products, including those from the Clasimat. In the Amagosa warehouse, they have installed two 28’ high Clasimats with 20 trays in each. These trays, stored in the support structure by a shuttle, are 7.9’ long and are capable of supporting up to 1,102 lb of goods. Mecalux Easy WMS (warehouse management software) communicates with the ERP SAP of the customer in a permanent, or bidirectional manner. Increase in storage capacity: the Amagosa clad-rack warehouse works with single and double-deep racks offering a storage capacity of 3,500 pallets, 31.5” x 47” in size and 6.5’ in height, in a surface area of only 10,764 ft2. Efficient picking: the combination of the pallet flow channels, the picking station and the two Clasimats allow them to make efficient preparation of all products (A, B and C). Productivity improvement: thanks to the high level of warehouse automatization, the speed of order preparation has increased.